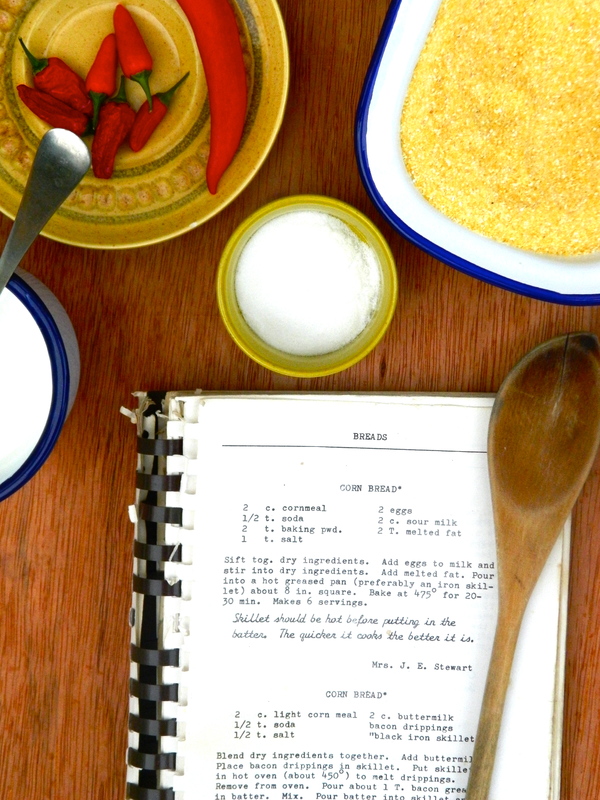 This cornbread recipe comes from an old cookbook that my mum brought back from Norris, Tennessee. It's absolutely foolproof, making a beautifully rich and flavoursome dishful every single time. After a good bit of pestering, one of my friends agreed to have us over to his house for Halloween this year. Despite the short notice, he’d made fresh crusty bread in a pot (his party piece), lemon and gin cocktails (his other party piece), chilli with sweetcorn and coriander, and a big earthenware casserole dish of roasted onions and sausages. It was just as delicious and warming as it sounds, and it was totally perfect party food for the wet and windy weather that Halloween night invariably brings. It also made me smile, because it read exactly like one of those ‘Bonfire Night’ specials you see in GoodFood Magazine or on the BBC Food website – you know, jacket potatoes, sticky barbecued sausages, Toad in the Hole, ‘cinder toffee’, beef chilli, enamel mugs of hot chocolate – all of the sort of food you’d love an excuse to eat on a cold damp November night but never could, because it’s much too British to remember the 5th of November in any shape or form, let alone celebrate it. But this is the kind of food that damp and dreary November needs – warm, cheering and faintly celebratory; food that bridges that gloomy gap between Halloween and Christmas. Unfortunately, however, unlike Britain, America and Canada, with their special Bonfire Night and Thanksgiving dishes, Ireland doesn’t really have any of this kind of November ‘feast’ food. We have barm brack, we have a glut of Time Out bars at Halloween and then we have Christmas, and that is that. So last week, on one of those raw and drizzly days that give November a bad name (everything was wet) I decided to make my mum’s cornbread and my own homemade baked beans. The colours were bright and cheery, the tastes comforting and familiar, and November suddenly didn’t feel quite so grim. 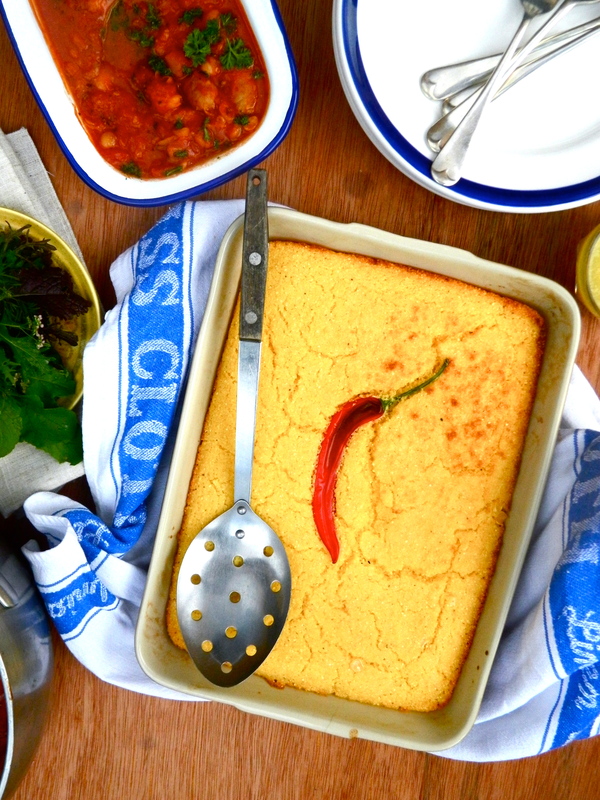 This cornbread recipe comes from an old cookbook that my mum brought back from Norris, Tennessee when she was about 19, so it’s definitely authentic. 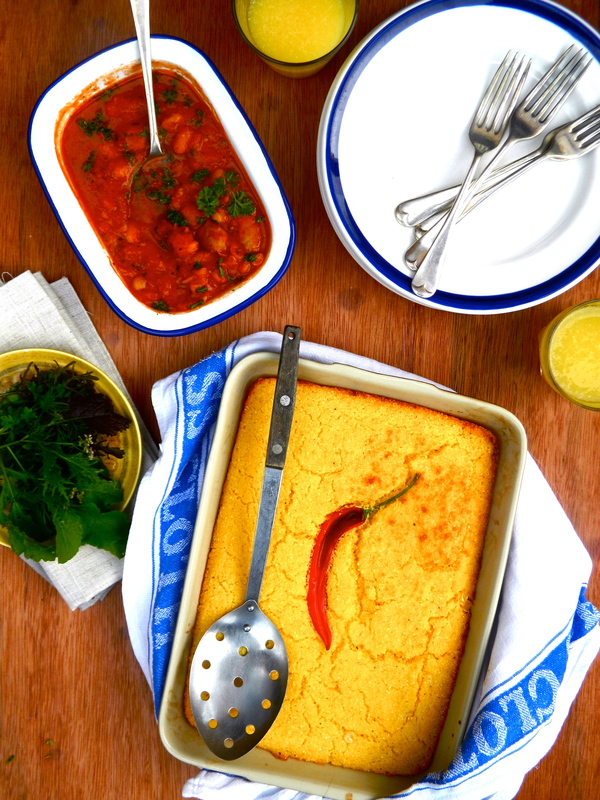 It also tastes much nicer than most forms of restaurant cornbread as it’s savoury rather than overtly (or even faintly) sweet. It’s absolutely foolproof, and works a treat every time – I made it countless times for my Junior Cert Home Ec practical, and it never let me down. 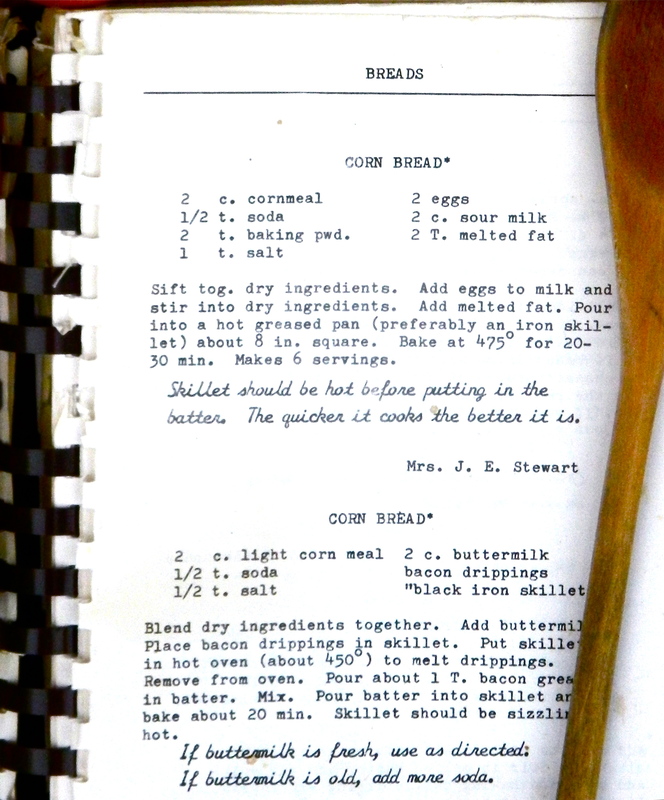 The recipe itself comes from a Mrs J. E. Stewart, who advises that the skillet should be hot before putting in the batter. ‘The quicker it cooks, the better it is’. 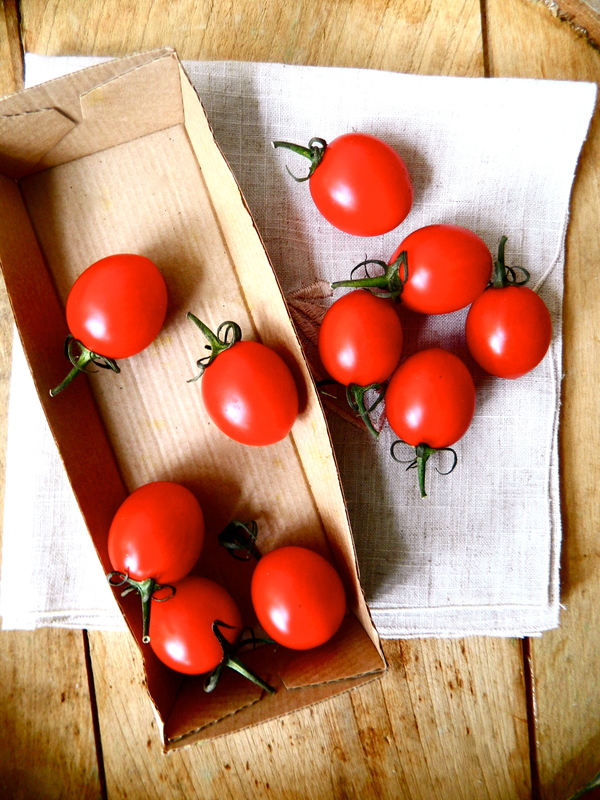 Additions (not in Mrs Stewart’s recipe but very pleasant nonetheless): grated cheese, half a cup of frozen sweetcorn, chili peppers, sunblush tomatoes…. Preheat oven to 200ºc. Butter an ovenproof casserole dish or baking dish and place in the oven so that it’s sizzlingly hot. Sift together the dry ingredients. Beat the eggs in a different bowl, mix in the buttermilk, and then stir into the dry ingredients. Melt the two tablespoons of butter and add to the mix. 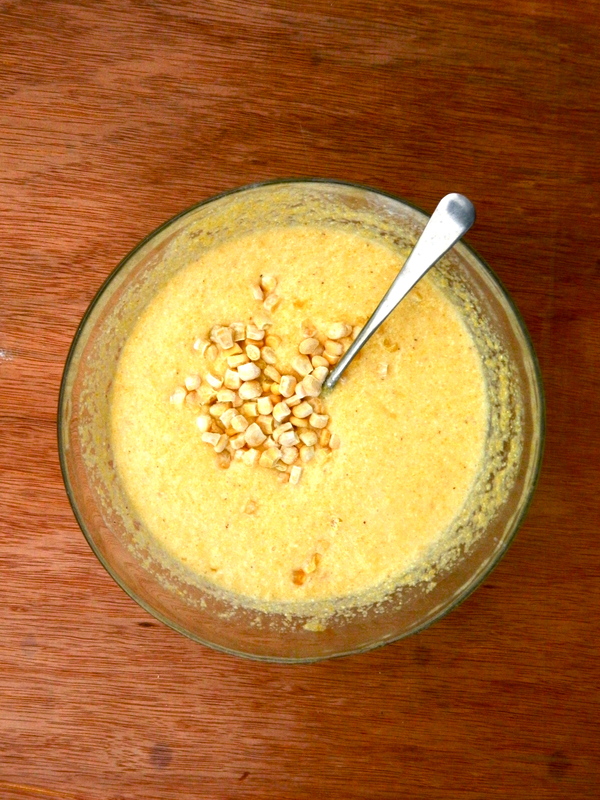 (If you’re adding any additions, press them into the top of the cornbread mix now. I can really recommend the frozen sweetcorn, as it gives the bread a great texture). Pour it into your scorching hot baking dish and bake for about 20 to 30 minutes. Serve hot, with lots of butter. 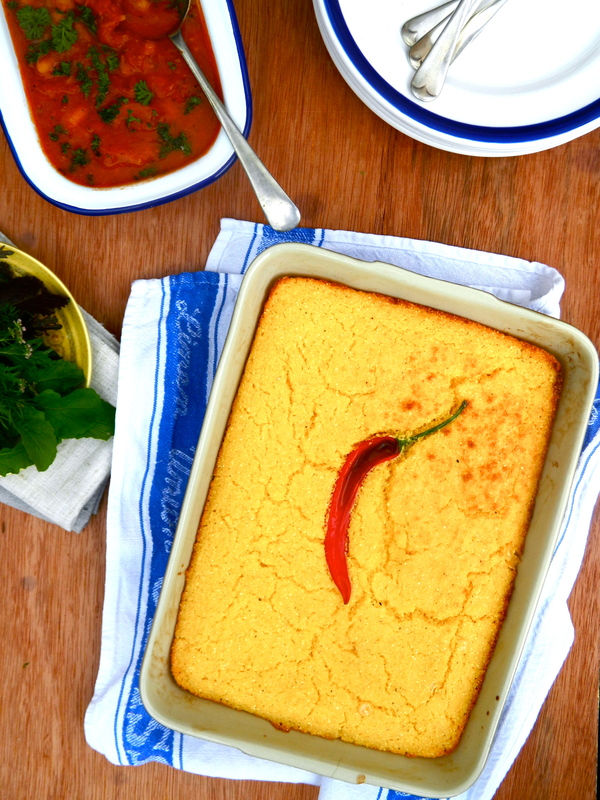 In the unlikely event that there’s any leftovers, grill squares of the cornbread and serve warm. The homemade baked beans were originally inspired by the Cake Café’s sausage and cinnamon version. Chop the sausages into quarters and fry in some vegetable oil. Once they’re golden brown, turn down the heat and add the diced garlic, allowing it to cook gently in a little pool of oil so that it doesn’t burn. Add the spices and the beans and cook for a little while. Season. Add the tomatoes and stock and cook for about 20 minutes, tasting and seasoning as you go. Once the mixture has reduced by about half, serve steaming hot with torn fresh coriander or parsley on top.